Thought I was hiking a lot in Canada I didn’t hike each trail in this huge country, so it can be subjective opinion, but for me hiking in Yoho national park in British Columbia was most impressive. Next time I would love to go there with tent as there so much more to see and you can camp in backcountry. But you can still see a lot even if you have only one day. For one day visit I suggest combine two trails – Lake Oesa Trail and Opabin Plateau Circuit. The combined trail length probably will be less then 8-9km (5-6 miles) with maximum 240-250 meters (800ft) elevation gain. 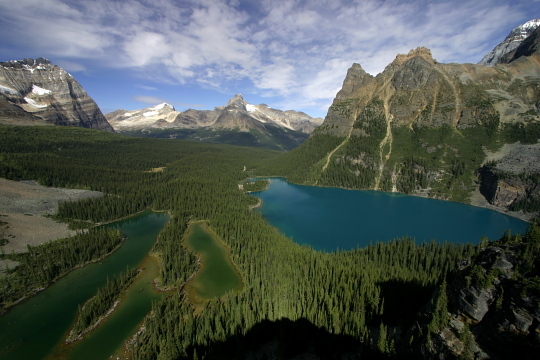 This allow you to see O’Hara and Mary lakes from above (first picture) and to visit Lake Oesa with Rocky Mountains behind it (second photo), visit Opabin Plateau with some smaller lakes and come back down to lake O’Hara. Doesn’t it sound like perfect day in the mountains with easy hiking? There is one very important thing – you must prepare for this trip in advance. I am not talking about physical training, but visitor number restrictions may be is one of beauty of this park as you don’t see big crowd there thought park is only 200km (130 miles) from Calgary or only 30km (19 miles) from Lake Louise in Alberta. But these restrictions means you need to make a reservation well in advance for a seat in the bus. At moment only 42 day visitors are allowed. 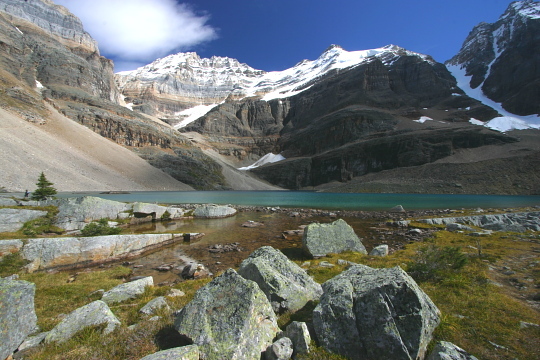 Of course you can hike the 11 kilometers access road from car parking to lake O’Hara, as there is no limit how many people can get to the lake on foot. But access road is not pictures at all and I would avoid hiking that road. Check this page for bus seat reservation and other latest information about access to the park. What a beautiful trail. Good to know that you must plan in advance. It is worth spending one of your days in the Lake O’Hara area if you can get a spot on the bus. If you have to hike in, Lake O’Hara is a nice place. Beautiful photos. I’ve hiked a lot in Banff and Lake Louise but for some reason have never made it to Lake Ohara, but I like that the number of visitors are limited, even if it does require a bit more planning. Yes, this does sound like a perfect day in the mountains! Your photos are excellent. 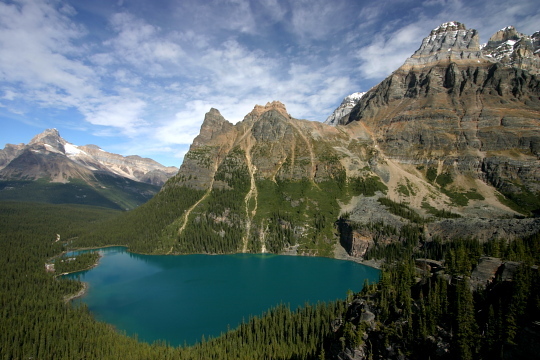 I’ve wanted to spend a few nights at Lake O’Hara Lodge for yeas – yes despite the price. I have so wanted to do this hike – maybe this fall when it’s not quite so busy and I can still camp. Wow, the scenery is extremely beautiful, I want to see this place personally someday. The lake scenery is quite breathtaking. What beautiful country. It is good that the the number of visitors is limited, which I imagine is to look after the environment. The information is good to know for planning ahead. Thanks. You weren’t kidding, that IS a beautiful hike! I would love to make a trip out there to do it some time, but I’m a pretty amateur hiker. Would you say it’s a difficult hike or do you think I could make it? The photos from your hike are beautiful. Thanks for sharing them. It has been many years since I have been to Canada. That trip was a week-long canoe trip in a very secluded location. I agree with the other commenters that it is great the number of visitors are limited. I also think it is great that you can get that spectacular view of nature on a day hike! We can see any picture, but unless you actually see it, it is so breath taking. Good thought and will for sure bookmark your site. Thanks for the thought. This is so beautiful. The photo’s of Lake O’Hara are just so inspiring. Camping here must happen the next time I’m in BC.